The Leatherback or Luth is the largest living turtle: it grows to more than 1,400 pounds in weight and may have a shell length of about 6 feet. Curiously, it also has the widest range of any reptile. Its role among sea turtles has been compared to that of the giant albatross among sea birds: both range far over tropical and temperate oceans. 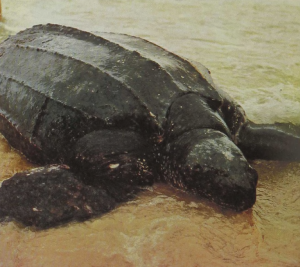 Leatherbacks have been caught off Australia and near the northern tip of Norway, and a recent monograph was based on a specimen that had managed to end up in the Baltic. These large turtles lack an outer horny covering to the shell, and even its inner support is provided only by a loose series of small bones rather than solid, interlocking plastron and carapace. The neck contains a heavy sheathing of fat and cannot be retracted within the shell. Leatherbacks seem to feed on large marine invertebrates, mainly on big jellyfish, including the Portuguese man-of-war, the sting of which is very dangerous to man. Perhaps the heavy, horny papillae lining its throat protect the turtle.